In the United States the public is involved in a deeply impassioned and important dialogue about weaknesses in our system of justice. In recent weeks incidents involving young black men killed in confrontations with officers from their local police departments have weighed on the nation’s conscience. In all of these situations the public has perceived that unnecessary, excessive force and a rush to judgment was used by police in situations that resulted in the death of unarmed and possibly innocent young men. In two of these cases the local prosecutor’s offices refused to indict the police officers of any kind of a crime. In one case the coroner ruled that the young man’s death was clearly a homicide. The angry demonstrators in our streets are demanding that our justice system take stock of itself, and refer back to the American Dream of Life, Liberty and the Pursuit of Happiness that we claim as our birthright. It would seem that these young men were denied this dream, perhaps even from birth. About two years ago a series of animated cartoons flooded the Internet amusing all who saw them by their irreverent and frankly alarming exposure of life inside a small local police department. The YouTube cartoons were produced by a member of the Renton Police Department wanting to expose the hypocrisies, self-serving behaviors, and downright illegal operations that he found as commonplace inside his own work environment. At the time the cartoon animations struck us as profoundly important: the anonymity that the Internet provided this police officer allowed him to speak absolutely truthfully and fearlessly, without the risk of internal retribution from those he was embarrassing. The viewer gets a fly on the wall account of what really goes on inside a small police department. Were the animations – though they named no individuals and no police force – a form of cyberstalking? Renton’s chief of police and city prosecutor thought so. Were the animators covered under First Amendment freedom-of-speech protection? Xtranormal, the company whose software was used to create the Renton animations is no longer active, though other freeware is out there. 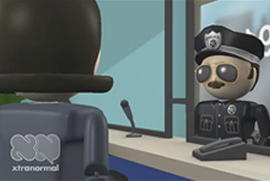 But after being reportedly outed by YouTube’s parent company Google, two policemen involved in one of the animations were demoted. We’re presenting a link back to these Renton police animated videos because we think they provide important insights for those people who are demanding a fundamental sea change in the relationship between our communities, our police departments, and our system of justice in the United States.